As Jacques Delors once (in 1992) famously put it: „Not all Germans believe in God, but they all believe in the Bundesbank”. Meanwhile, while both numbers are declining, more (Western) Germans seem to believe in God than in the European Central bank. Whereas (dis-)believe in God is rather stable, the (dis-)trust in the ECB is quite dependent on mood, politics and the business cycle. An academic paper with lots of econometric work (Nr. 124 here) shows that (and tries to show why) trust in the ECB has reached historical lows from September 2008 onwards (with net-trust close to or even below zero, in France even more so than in Germany). For a time-series see also here. A more recent poll suggests that a relative majority of Germans has little or no confidence in European Central Bank President Mario Draghi whereas the President of the Bundesbank, Jens Weidmann, enjoys much popularity with German academics and media – but no longer more than lukewarm support of the German government. Naturally, German politicians both in government and in opposition are quite relieved to see the ECB now taking care of large parts of the Eurozone bailouts. Berlin hopes to avoid the embarrassing situation to let more large and unpopular rescue packages pass parliament before the federal elections in September this year. But what does Jens Weidmann believe in? And why does he oppose much of the current ECB and ESM policies? A few days ago, he gave a talk at the renowned Walter Eucken Institute (est. by Ludwig Erhard in 1954) at Freiburg University. The full text can be downloaded here in English and here in (original) German. The speech is on “Crisis management and regulatory policy” or “Krisenmanagement und Ordnungspolitik”. The very term “Ordnungspolitik” is not very well translated as “regulatory policy” – in fact, as with “Schadenfreude”, “Heimat” and many others, there is no English word for it. But “Ordnungspolitik” is the “Leitmotiv” of Weidmann’s speech. And “Ordnungspolitik” had much to do with the German post-war “Sonderweg” that made the so-called “Wirtschaftswunder” possible. If you are keen to learn more about that history, you find a lot here and here. On Eucken’s contribution to that concept you find more details here. And on German “neoliberalism” as a European Social Model here. But now to Jens Weidmann’s speech and his defense of “Ordnungspolitik” in times of crisis. The President of the Bundesbank starts by reminding his audience in Freiburg that according to Eucken and the ordoliberal “Freiburg School” that provided the intellectual ground for the concept of the post-war German social market economy ”economic policy was to be consistent with market principles and adhere to the principle of subsidiarity – what can be regulated by the market should be regulated by the market”. It is geared to the principle of open markets: in the single European market, this principle is safeguarded by four basic freedoms. It is geared to the principle of subsidiarity, which is explicitly enshrined in the EU Treaties. It is geared to the principle of liability, which was incorporated as a “no bail-out” clause into the EU Treaties – according to which no member state shall assume liability for the debts of other members. And it is geared to the primacy of monetary policy – something which, on professional grounds alone, I feel very strongly about." "However, it would be wrong to conclude that we have to build an entirely new framework and give up the tried and tested regulatory policy principle. As a matter of fact, the framework’s weak spots were located precisely where basic principles of economic policy had been neglected". 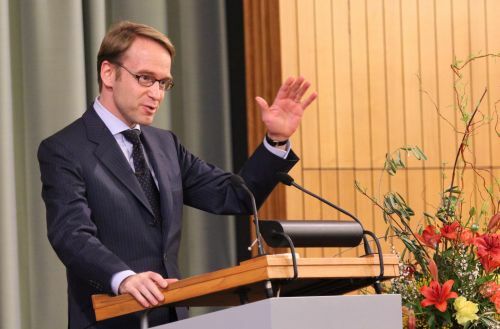 For the rest of his speech, Weidmann picks two out the six basic principles of Eucken’s “Grundsätze” for the establishment of a "workable and humane economic order" for further scrutiny: individual liability and sound money. "The expectation of government bonds not defaulting was fuelled by the assumed systemic importance of individual euro-area countries. The reasoning goes that if the default of one country threatened the existence of monetary union, the other countries would jump in the breach to prevent more damage – despite the no-bail-out rule. This expectation put downward pressure on risk premiums on government bonds, thus distorting the pricing system; and we all know what happened next. We face the same problem in the financial markets. If one bank looks likely to default and inflict damage on the entire financial system, the state will probably come to the rescue to prevent the situation from escalating – the bank is thus "too big to fail". This leads to inadequate risk premiums for claims on this bank; they distort competition and encourage players to enter into even riskier transactions. Yet systemic importance not only distorts the signals sent by market prices; it also, in a crisis, uproots the principle of liability. In rescuing a systemically important bank, at least part of the creditors’ losses are borne by the taxpayer. Excessively risky transactions therefore go unpunished, and a gap grows between benefits and potential damage. The same applies if a systemically important country is rescued. The decisive question is thus how to give the principle of liability more heft – in the financial markets and among governments. Higher capital requirements for banks are one such approach. They enable banks to shoulder greater losses by themselves and thus shift the risk back to the owner. Government bonds, in particular, should be adequately backed by capital in future. Plans to ringfence certain risky banking business by creating independent trading units within banks are another such approach – they reduce internal cross-subsidising of risky trading business, thereby giving depositors better protection from the risks of such business. The banking union is yet another. It shifts banking supervision to the European level and can thus ensure a better equilibrium with regard to liability and control between investors, national taxpayers and euro-area member states. For this to succeed, the banking union needs not only a central supervisor but also resolution regimes which can help systemically important financial institutions too to file for bankruptcy without causing damage to the system while, at the same time, creditors participate in the costs of the institution’s failure. In order to strengthen the principle of liability at the level of sovereign states, the framework of monetary union needs to be improved. Even with regard to government finances, liability and control must be in equilibrium. In the Maastricht framework, both liability and control were, essentially, located at national level. During the crisis, however, we moved away from this: control remained national, whereas liability has been increasingly transferred to the European level. While national governments take independent decisions on debt, the community is liable for the consequences. This set-up is a breeding ground for renewed unsound developments. I therefore see only two convincing options. Either we shift control and intervention rights to the European level as part of a fiscal union; or, in the sense of a return to the Maastricht framework, we strengthen the liability and independent responsibility of member states. Taken to its logical conclusion, this also means that we cannot – and must not – rule out the possibility of sovereign defaults. As things now stand, however, it is not quite clear which of these two directions policymakers are leaning towards; they seem to be performing a balancing act, with one foot in the Maastricht world and the other in a fiscal union. In the long run, such a balancing act is painful and unhealthy”. "While policymakers vacillate, expectations of central banks increase. The Eurosystem is being cast as the only actor on the European stage with any ability to take any meaningful action. Accordingly, there are ever-increasing calls for the Eurosystem to do even more to resolve the crisis. I consider this a bad idea, for two reasons. First, the Eurosystem cannot resolve the crisis. The causes of the crisis are structural, and are to be found at the individual member state and the European level … Only policymakers can solve these problems; central banks cannot. To that extent, the discussion surrounding an allegedly overvalued euro is just a red herring to divert from the real challenges. Experience of politically motivated depreciations in the past has shown that these generally do not lead to any lasting gains in competitiveness. Often, renewed depreciations are necessary. If more and more countries try to depress their own currency, this can culminate in competitive devaluation, which will only produce losers. Exchange rate developments are naturally taken into account in monetary policy decisions inasmuch as they influence price developments. However, an exchange rate policy designed to weaken the euro intentionally would end up leading to higher inflation. The second reason why the Eurosystem should not do even more is that the Eurosystem has already done much to contain the crisis. It has cut interest rates; it is supplying virtually unlimited liquidity to banks; and it has intervened in the bond markets.With these measures, the Eurosystem – like other central banks round the world – has taken considerable risks, and it has stretched its mandate considerably. As Eucken might have put it: the primacy of monetary policy is no longer clearly evident. As the UK bank HSBC’s chief economist, Stephen King, put it, monetary policy has lost its political neutrality. He also notes that central banks round the world are redistributing wealth through their crisis measures. For example, by buying government bonds or imposing lax standards on collateral, the Eurosystem, in his eyes, is contributing to a redistribution of risks among the euro-area countries’ taxpayers.This redistribution is a very relevant problem in terms of the theory of democracy: in principle, only parliaments and governments, with democratic legitimacy, should be redistributing wealth – not politically independent central banks ... this creeping or even open politicisation of central banks is causing me concern. The value of independent central banks is borne out not only by theoretical considerations but also by historical experience. I have already mentioned Italy as an example; England and France have seen similar experience, too. Walter Eucken would object here: he took a dim view of independent central banks. As he saw it, experience had shown “that a monetary framework which gives monetary policymakers a free hand usually deems them capable of more than they should be regarded as being capable of doing”. 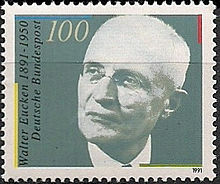 As an alternative, Eucken championed a strictly rules-bound monetary policy. And this is also being given serious consideration, especially by those who feel that central bank independence has to be associated with a narrow interpretation of its mandate. … It must be recognised that the aim of a stronger rules-based policy framework is to prevent the primary objective of monetary stability from being watered down. Central banks use these rules to tie their own hands in order to avoid being co-opted by fiscal policy.Eucken emphasised time and again, and I agree, that monetary stability is the basis for functioning competition, for a market economy and for general prosperity. However, I am also convinced that monetary stability is possible only with independent central banks whose mandate is focused on preserving price stability. At all events, I am convinced that the crisis does not justify discarding this framework, which has proved its worth in theory and through practical experience”. "… the economic policy principles which mark our economic order and monetary union are anything but outdated. They point the way towards a lasting resolution to the crisis.A central economic policy challenge here is to give the principle of liability renewed heft, both in the financial system and in monetary union as a whole.Another challenge is to preserve and protect the role of central banks as independent, clearly focused guarantors of monetary stability. I therefore wish to conclude by reiterating …:I definitely recommend that all politicians put under their pillows a copy of Eucken’s book Principles of Economic Policy." And I hope that many non-German readers found these lengthy quotes helpful to understand what many people in Germany think – and why. It may be the Kantian heritage (s. page 13 ff) that also influenced Eucken – and Weidmann; and at least occasionally some “Ordnungspolitik” is also the “Leitmotiv” of Angela Merkel.